So, I'm at a four way stop, except it isn't technically a four way stop. Imagine a conventional stop, but with the 6 o'clock position being the exit of a private drive way (a school parking lot). That's right, the school pushes traffic back out onto the road way at a four way stop. Technically, the stop sign is on school property and not part of the four way stop. Its technically a three way stop for normal traffic. I hope I've explained this well. So, I'm leaving at 6 and turning to 9 (a left hand turn). I proceed after the traffic to the left has come to a full stop, I look to the right and no one is there so I proceed. In the time it takes me to make the left turn (out of the private drive onto the road) a car has come from the right (likely a rolling stop) and met my front passenger corner on the exit of the turn (ie. well out of the middle of the intersection). So my passenger front is hit by (sort of a meeting of two cars rather than one hitting the other) her driver front corner. Now, there was no charge, but the insurance is applying the HTA in that I should have yielded to the right, so its my fault and thus an at fault claim. My question is: Am I actually at fault here? If all of the other traffic MUST stop at the stop signs, do I need to actually stop or just ensure its safe to proceed (as is normal when exiting a private drive way). The fault determination rules are not always consistent with the Highway Traffic Act. Is there actually a stop sign for traffic exiting the school lot? Do you have a copy of accident diagram from the police and do they list you at fault? Were there any witnesses who stuck around and provided statements? Hi Thanks for the reply and that link. There is a stop sign, but its on school property, erected by the school. 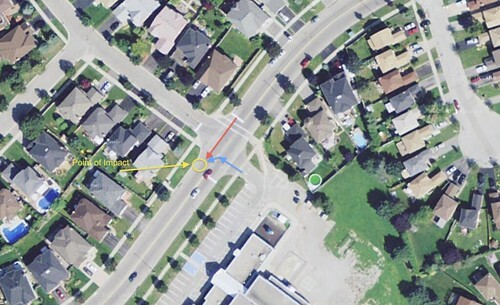 There was no accident diagram because the police didn't show up due to the fact no one was hurt and the damage was minor, so no one is at fault per se in the eyes of the law. There were no witnesses who stayed (of course). It was just a fender bender, everyone is totally fine, but I have issue with the fact that its word against word, and total fault is with me apparently and not 50/50 at least. Here's an image of the actual intersection. My direction of travel is in blue, the other driver in red. Yellow circle being the point of impact. 139. (1) Every driver or street car operator entering a highway from a private road or driveway shall yield the right of way to all traffic approaching on the highway so closely that to enter would constitute an immediate hazard. Traffic entering a highway from private property must yield the right of way to all traffic on the highway. Without a witness you're probably going to have an uphill battle to prove that the other vehicle didn't stop. Even if the police did show up, the outcome would probably be the same.